In the Greater Hartford Welcome Center rests a red cubical jar that contains tiny blue slips of inspirational quotes. During a particularly potent 2:30 slump, I reached into the jar to find an interesting idea from Constanze: “Dancing is like dreaming with your feet!” Although I have always been fascinated by dancers’ ability to make meticulous and exacting movements appear effortless, my feet must be agents of nightmares, since they have inspired more dread and terror than musings in my lifetime. Fortunately, I saw Constanze’s quotation come alive in a few different ways at the Arts Council’s Dancing in the Street Public Art Project yesterday (May 2). 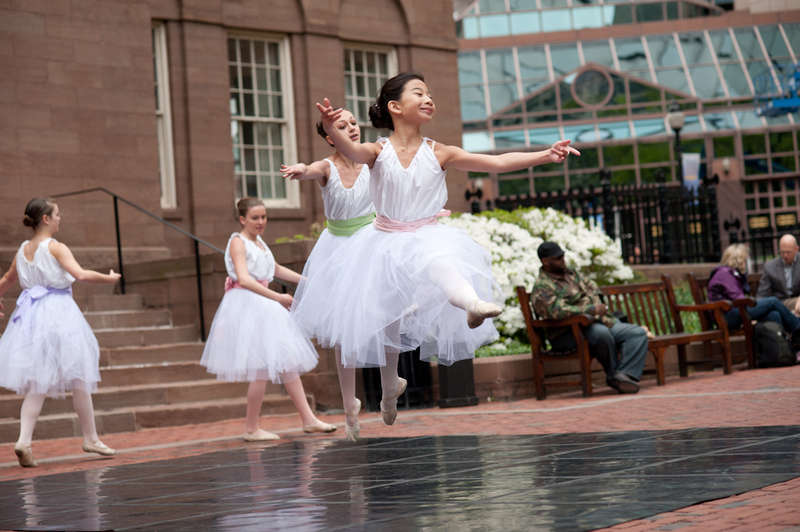 Another event in our Aetna Arts Week, Dancing in the Street featured performances in downtown Hartford’s Statehouse Square by Judy Dworin Performance Project, dancEnlight, Spectrum in Motion, Ballet Theatre Company, Sonia Plumb Dance Company and Allongé Dance Variations. 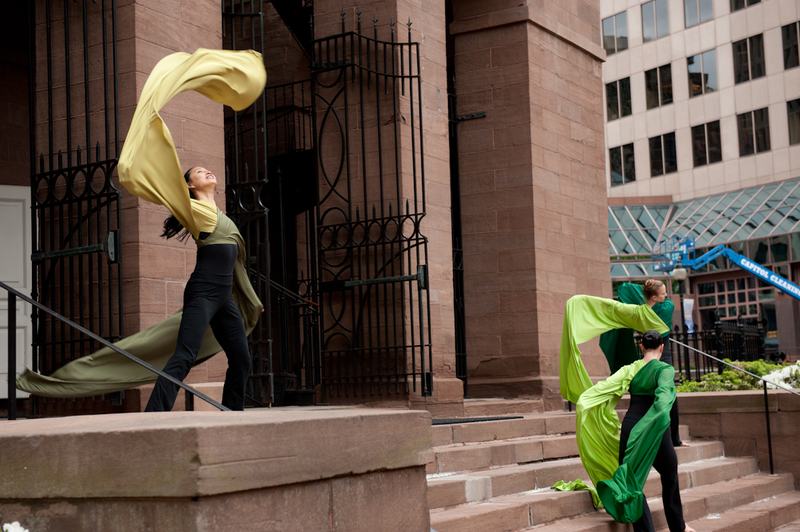 This free lunchtime event showcased the variety and excellence of dance in our community in a way that any passerby could take part in and appreciate. With each performance lasting less than five minutes, visitors were treated to a number of different dance forms in a short amount of time. Some of the types of dance included spicy flamenco, classic ballet and more contemporary pieces. After seeing a performance, attendees could then talk directly to the dancers and learn more about the dancers, the dance company and/or just dance in general. For those not familiar with the art form, Dancing in the Street presented a great chance to get up close and personal with art in an atmosphere away from a formal stage or ticket prices. Throughout the event, I was in charge of carrying out the performance schedule as the self-appointed “MC” for the day. In spite of my managerial responsibilities, I found some time to break away from the desk to do a little dancing myself. In an attempt to transform my monsterish coordination, I asked a few of the pre-teen ballerinas from Ballet Theatre Company to give me a crash course in balance and movement. Painstakingly, I tried being a good student by following their suggestions to a tee. However, somewhere in the middle of tweaking my knees out, keeping my back straight and my hands in a specific position, I lost my balance and nearly fell, receiving hearty guffaws from all of my instructors. If I did in fact hit the ground, I guess that could be one way dance evokes dreams. Much thanks to each dance company for participating in the day and for those who stopped by. It truly was a fantastic and memorable event I am proud I had the opportunity to help organize and create. 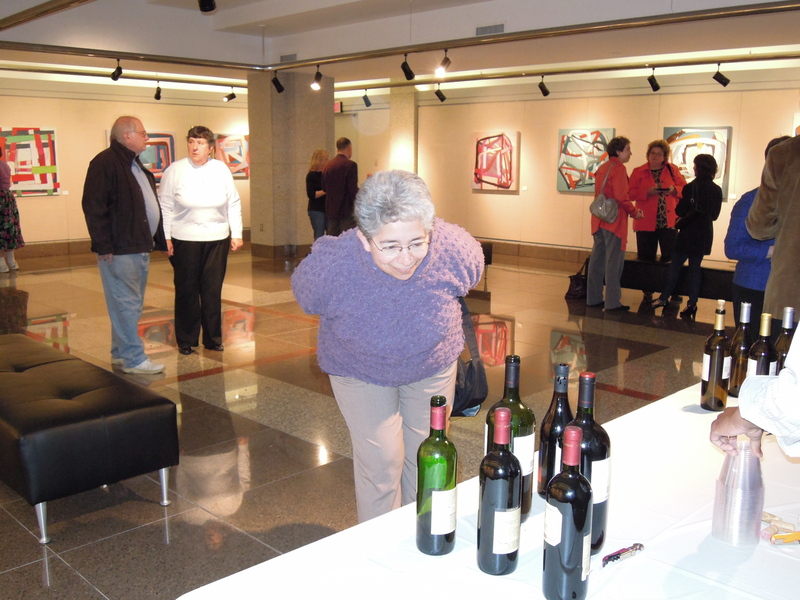 Aetna Arts Week is back: April 30 to May 6! Here at the Arts Council, we’re constantly encouraging people to take pART in the arts all around them–see an exhibit for the first time, catch a play or performance or even try their hand at something artistic. And, from April 30 to May 6, we’re making ity super-easy to find and enjoy something artsy: just take pART in Aetna Arts Week! A year ago we created a brand-new program, then called United Arts Week, designed to show the community all of the wonderful organizations, events and activities funded by generous United Arts contributions. Thanks to the generous support of Aetna, the program has been growing ever since! Twice a year, we work with our grantee organizations to create a menu of free and low-cost arts events showcasing the best in cultural “happenings” here in Greater Hartford. We use Aetna Arts Week as a chance to remind people that the arts are accessible—and fun—for everyone, and as a way of reminding people about all the wonderful events made possible by their donations. You’re sure to find something to get your ART beating: there’s theatre, dance, music, visual arts—even a board game party. Check out the full line-up of events on our web site, feelyourartbeat.com. And if you can’t make one of the scheduled events, make sure you check-out some of the ongoing performances and exhibitions happening throughout Arts Week. 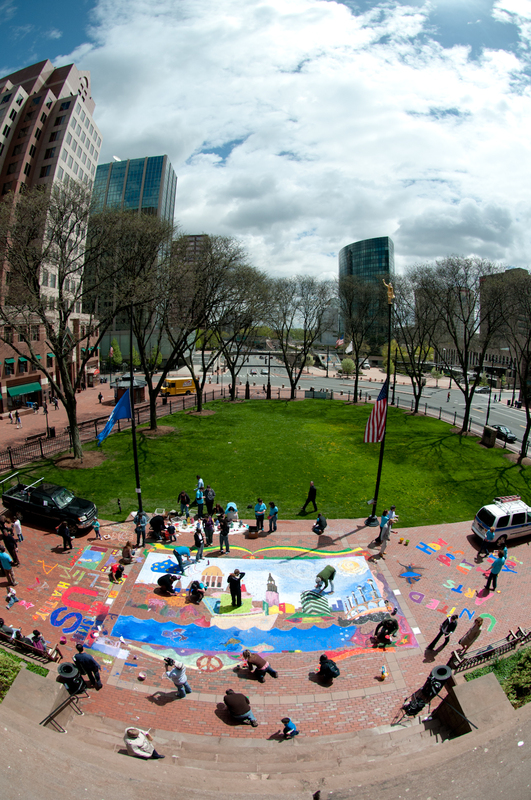 Street painting project in State House Square, part of the Spring 2011 Aetna Arts Week. Each week we try to create a “temporary public art project,” something interactive (and, again, fun!) that downtown dwellers can take pART on their lunch break. Last spring, we created an amazing water-soluble coloring-book-style mural in State House Square , and in the fall we built giant magnetic boards at the Hartford Public Library where passers-by could create their own evolving piece of magnetic poetry word art. 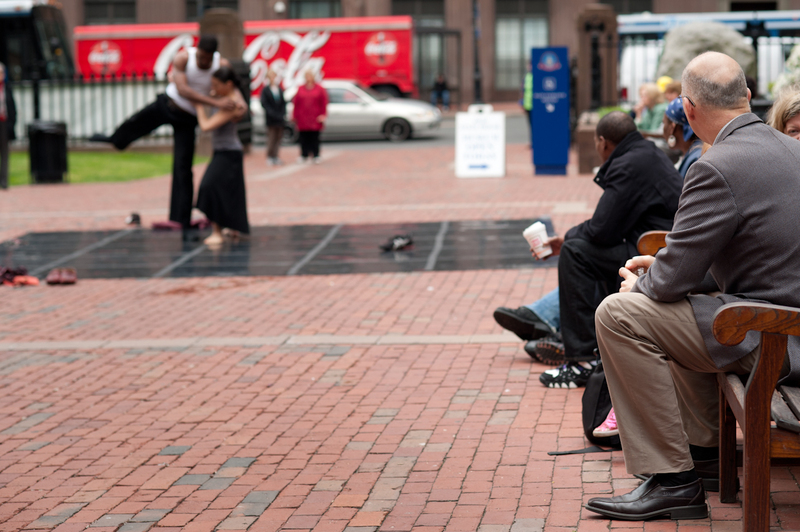 This year we’re exploring “Dancing in the Street,” a project featuring performances and workshops by some of Greater Hartford’s best dance groups and artists. 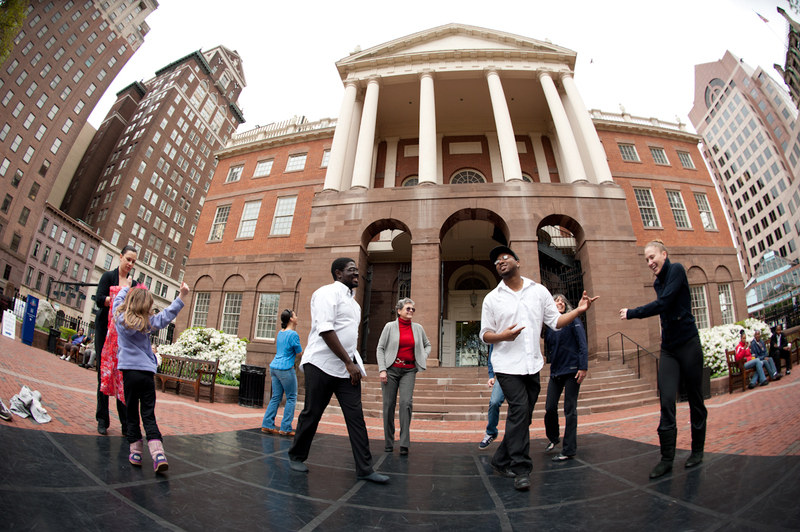 On Wednesday May 2nd, take a break between 11 AM and 2 PM and head down to the Old State House to see performances by 7 different local dance groups and even learn a few moves of your own. Friendly Arts Council staff members (dressed in bright green shirts) will be on-hand to introduce you to the dance companies and get you engaged in one of the most amazing—and diverse—forms of art our community has to offer. We’ll be posting pictures, videos and testamonials from Aetna Arts Week on our web site and this blog. Got an Arts Week story you want to share? Let us know! 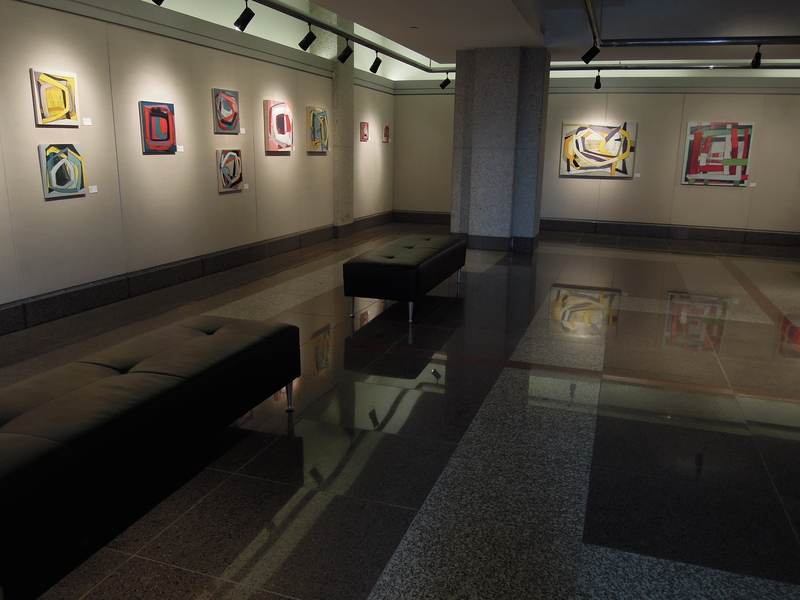 Tucked inside the first floor of our office building rests the 100 Pearl Street Gallery. The venue provides a great space for local artists in the community to showcase their work, usually displaying about 5 artists a year. 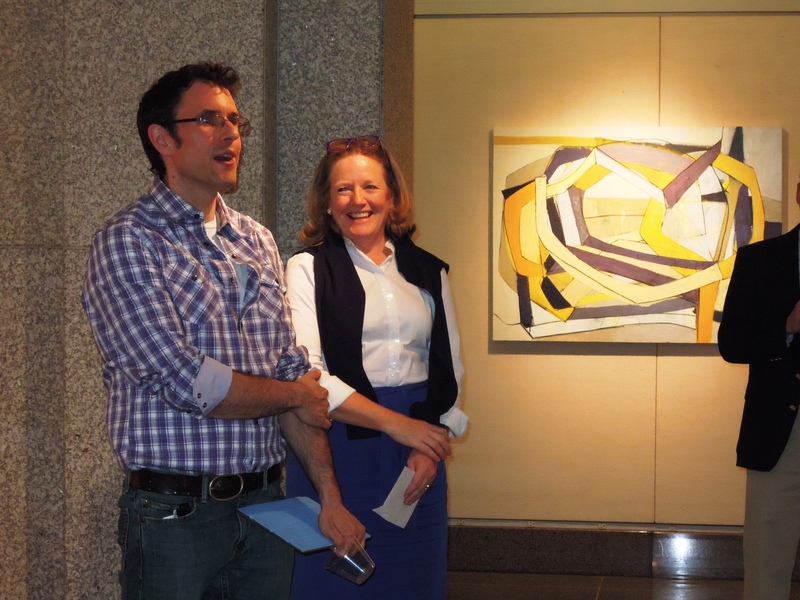 Last Thursday (Apr 11), the Arts Council celebrated the opening of our newest exhibition “Interface: New Work,” Paintings by Matthew Best with the artist himself. Amidst the wine, delicious hors d’oeuvres provided by The Kitchen @ Billings Forge and fine company, the reception presented me with the great opportunity to analyze and appreciate the intricacies of Matthew’s work. Let’s be clear – I am no art critic. Reading Evan Johnson’s construction of Matthew’s work in his interview introduction on our blog a few weeks ago only further solidified that notion in my mind. Regardless of my lack of knowledge of art history and theory, Matthew’s colorful and engaging shapes still intrigued me to learn more about his work. So. What’s a person to do when he or she hasn’t a clear place to start interpreting a piece of art but still wants to give it a shot? Luckily, the answer came to me in the form of a large poster containing the artist’s statement, where I learned that Matthew’s paintings are heavily influenced by his study of yoga and the body. 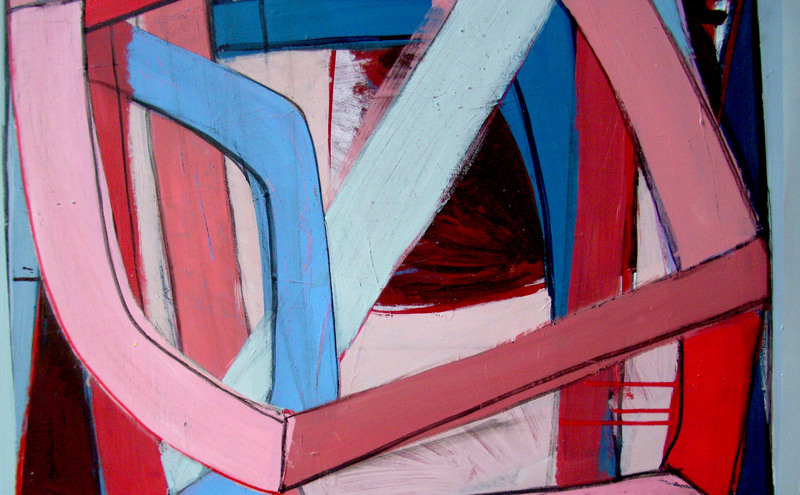 Viewing his work in that vein, I focused on how the concept of balance inter-played with the positioning of the colors and the usage of the shapes. From there, I could see how both forces worked to keep the pieces in harmony together, relying on each other to somehow keep the painting from metaphorically falling over. Moments away from what I’m sure would have been an artistic epiphany, my brain’s strain was relieved by Cathy Malloy, the Arts Council’s CEO, stealing the floor with Matthew on her right to thank everyone for coming to support Matthew and the Gallery itself. Reluctantly passing the floor to Matthew shortly thereafter, Matthew repeated Cathy’s warm sentiments of appreciation for everyone’s attendance and encouragement. To learn more about Matthew’s work, check out www.LetsGoArts.org/Gallery, his Twitter (@Matthew_Best) and his Tumblr pages: http://newparkave.tumblr.com/ http://matthewjbest.tumblr.com. 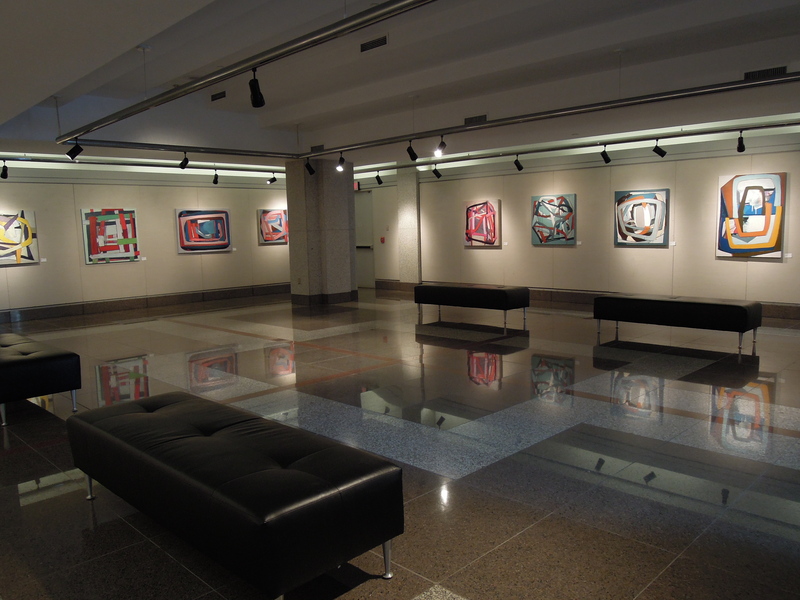 Also, make sure to stop by the Gallery and see the exhibition before June 1st. I promise the artist’s statement will still be there to inspire many musings about Matthew’s dense, impressive paintings. Sometimes it’s exhausting trying to keep up with all the exhibits, plays and performances opening (and closing!) every week. I guess that’s a good problem to have—with 150 arts and heritage organizations supported by our United Arts Campaign, it’s a pretty good bet that on any given night we have a hand in something new popping up. United Arts gives our grantee organizations reliable, consistent support they need to deliver really cool artistic programs. I did manage, a few weekends ago, to sneak over to the Wadsworth Atheneum on Saturday afternoon to see their newest special exhibition, Andrew Wyeth: Looking Beyond. Getting to the show became quite the comedy of errors: I was hoping to take a mid-day tour with Susan, our Welcome Center Coordinator, until I was smacked in the face by a debilitating cold; I tried to attend the member’s reception but got my dates all confused and ended up missing out; luckily, on a whim, a friend joined me for lunch and we decided to visit the show. If you’ve read my bio (and why would you? ), you’d know my artistic background is in theatre, but over the last couple of years I’ve developed a real interest in visual art–both the classic and the contemporary. 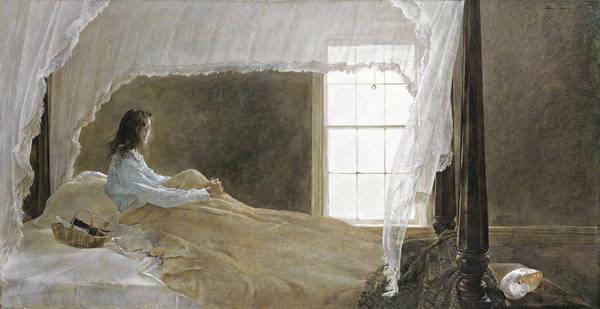 I’ve always had an interest—a soft spot, really—in Andrew Wyeth’s work, so I was thrilled the Wadsworth was launching an exhibition of his work with an interesting new focus. Looking Beyond plays off of some of Wyeth’s most familiar themes—doors, windows, vistas and open landscapes—to explore the theme of “what’s beyond” the viewer’s initial impression and the distance he creates between the viewer and his subjects. “Chambered Nautilus,” in the Atheneum’s permanent collection. The number of “finished works” on display is rather small, but the unique joy of this exhibition is the number of sketches and early watercolor studies of each work that gives tremendous insight into Wyeth’s creative process. (For another, just-as-cool look at an artist’s process, check out Red at TheaterWorks). My friend and I loved comparing the study to the final product, looking at what details Wyeth chose to keep—and discard—when composing his paintings. For an amateur, yet avid, Wyeth enthusiast, the “works-in-progress” made this collection of particular interest. But the jewel in this crown is actually the companion exhibit, “Wyeth,” a series of photographs by somewhat-local artist James Welling. Welling spent time visiting the famous locales of Wyeth’s work, capturing still images in dazzling color and depth of some of the painter’s most recognizable subjects. It’s amazing to see how time has stood virtually still at places like the Olson homestead, while other remote areas show the signs of a slowly modernizing world. Together, the two exhibits pack a real punch and provide some amazing insight into the work of a celebrated 20th-century artist. Andrew Wyeth: Looking Beyond and James Welling “Wyeth” are on display until July 22nd. Art by its very nature is a social happening. At the Arts Council, we are working hard to use this concept expertly and advantageously for the arts and heritage organizations we serve by encouraging us all to work more closely together in today’s trying times for the arts. In the spirit of this idea, last Thursday (Apr 5) three of our grantee organizations, TheaterWorks, Community Partners in Action’s (CPA) Prison Arts Program and Judy Dworin Performance Project (JDPP), joined forces to showcase a myriad of different art forms at Give Night where proceeds benefited both CPA and JDPP. 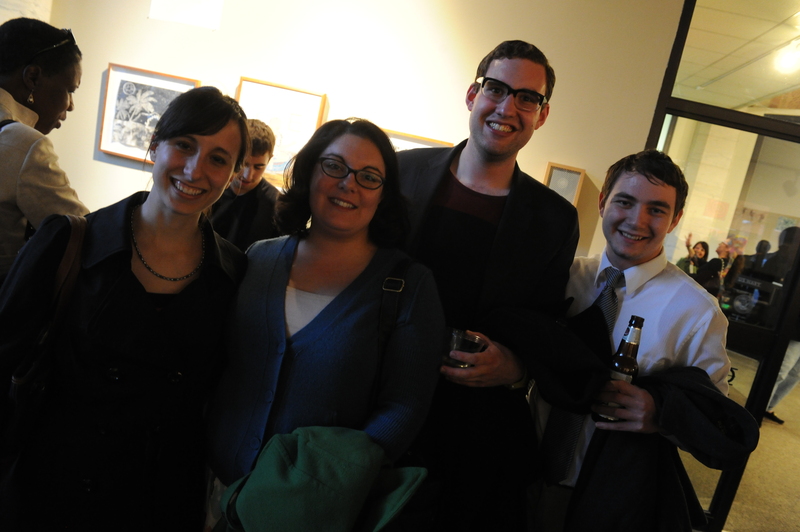 The evening boasted a reception hosted by TheaterWorks, a viewing of the women’s portion of CPA’s 34th Annual Show, as well as performances by JDPP. Additionally, the Arts Council’s CEO Cathy Malloy provided the curtain speech before a production of TheaterWorks’ newest play RED. Entering the jam-packed City Arts on Pearl building with my coworkers from the Arts Council, I first mused through the Prison Arts Program 34th Annual Show. Unlike other exhibitions I’ve seen where pieces seem connected through a common artistic style or technique, each artwork I viewed represented an entirely different approach manipulated by an entirely different story or background. Whereas some subtly alluded to a longing for family, friends and/or a return to a previous state, some emanated a fury and pain intensified by the difficulties of isolation. Before this exhibition, I have never seen any form of art from those incarcerated in prisons; however, after seeing and feeling the emotion clawing from each piece I saw that evening, I no longer will think about inmates the same way. 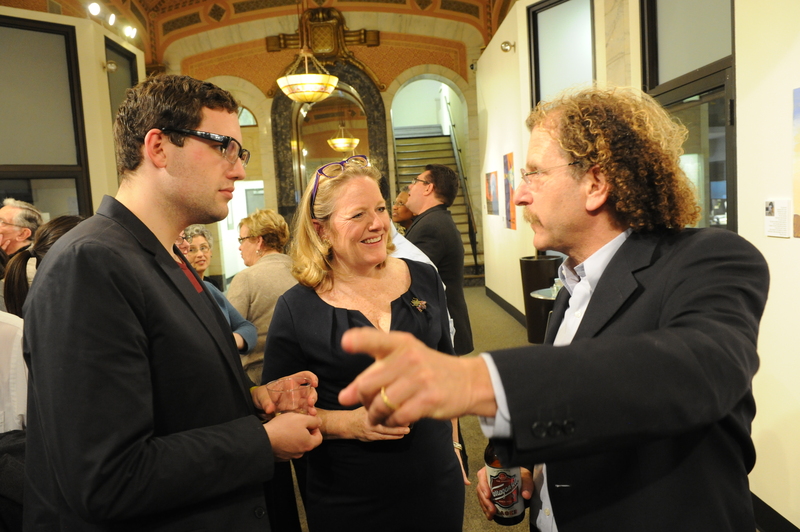 Tim Yergeau, Director of Communications and Donor Relations at Greater Hartford Arts Council, Cathy Malloy and Elliott Gersten, Esq. This sentiment was only furthered by JDPP’s performances, which included dancing, singing and spoken word excerpts from JDPP’s critically-acclaimed piece Time In and its newest Meditations from a Garden Seat. Inspired by the women of York Correctional Institution’s reflections on time as well as their dreams and aspirations, the performances gave movement and voice to the visual arts exhibition I had just seen. Considering each sight and sound as pieces in the evening’s artistic puzzle unlocked a holistic and affective illustration of what life is actually like for incarcerated women – its tests and toils, its hopes, and, ultimately, its humanity. Luckily, the investigative and pensive mood JDPP’s performances and the Prison Arts Annual Show generated inside me put me in the proper spirit for TheaterWork’s RED. Following the expressionist Mark Rothko just after his commission to produce murals for the Four Seasons Restaurant, the production challenged me to reinvestigate my understandings of the mind and emotion. Oftentimes I define concepts by contrast; for instance, darkness could not exist as an idea without light, happiness without sadness, etc. Perhaps mistakenly, I had always considered the mind dichotomous to emotion. Throughout Rothko’s passionate descriptions of his philosophies on art and life with his assistant Ken, as well-argued as they were, I couldn’t help but penetrate the words to search for a deeper emotional subtext. In essence, I used arguments, which originate in the mind, as a vehicle to unravel personality and emotions of the characters more than anything else, forcing me to reconsider definitions of concepts I thought I had ironed out through several grad school papers. In my eyes, this sneaky ability art has to incite reinvestigation is one of the major reasons it’s so vital in today’s world. Rather than remain stagnant, art continues to push creativity and change, expertly maneuvering around a set definition always. Through collaborations like Give Night, individuals have an opportunity to be a part of this social and cultural growth and to experience firsthand the variety of phenomenal, moving art available in our community. 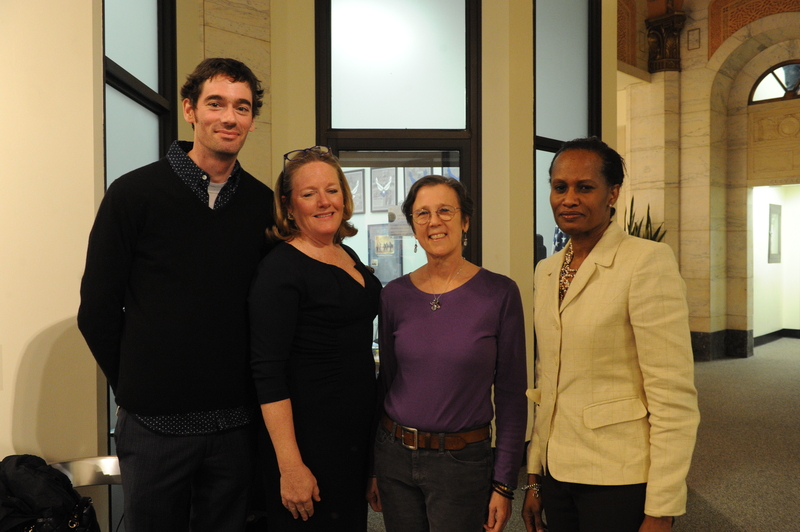 Congratulations again to TheaterWorks, CPA’s Prison Arts Program and JDPP for a wonderful and successful event. We’re very excited to announce a brand-new addition to our Workplace Giving roster this year: the Hartford Public School system. Each year, the Arts Council runs between 50 and 100 (usually around 75) workplace giving events in companies throughout our 34-town service area. We’re not just asking for donations—workplace giving makes up about one-third of the money we raise each year—but we enjoy the opportunity to connect local employees with amazing arts organizations and cool, interesting events and activities happening right in their backyard. Workplace giving takes on a variety of shapes and sizes depending on the company, but usually includes a presentation from the staff or one of our grant recipients and an interactive series of “arts breaks” giving workers the chance to escape their offices and try to do something artsy. And who understands the importance of the arts better than teachers? With the Mayor of Hartford as our 2012 Campaign Chair, we figured it was the perfect year to jump-start workplace giving in the public school system. I’m hoping we can use the workplace campaign to get teachers and educators excited about the wealth of world-class arts organizations and cultural institutions Hartford has to offer. Cathy had the opportunity to speak at the Superintendent’s Leadership meeting, a gathering of principals from across the school district, yesterday morning (blurry cell phone pic below). She made a passionate appeal to the leaders of the school system to help support our United Arts campaign, highlighting especially the importance of keeping the arts alive for generations of Hartford students. Their workplace event officially begins in a couple of weeks, and I’m looking forward to posting some exciting stories from this first-ever initiative as their campaign unfolds. Last week, the Arts Council’s 100 Pearl Street Gallery opened its doors to “Interface: New Work,” Paintings by Matthew Best, which will be on display until June 2nd. After spending some time with the work, I was impressed with the texture of Matt’s canvases. There are layers of brushstrokes and drawn lines that catalog his choices and movements in each piece. I immediately thought of Harold Rosenberg, the art critic who coined the term “action painting” to describe the work of young painters like Willem de Kooning and Franz Kline in 1952. He saw in their work a new interaction between painter and canvas, where the surface was a space in which to act – the painting became a record of the encounter between the artist and his canvas. Matt upholds this tradition, but reinvigorates it. To delve deeper into his work and thoughts, and to prepare for his exhibition’s opening reception this Thursday, April 12th from 5pm-7pm, I asked Matt a few questions about what inspires his art. What led you to pursue painting in your artistic career? I had always done a lot of drawing for most of my life. It wasn’t until I took my first painting class in high school that I had a kind of aha! moment. While I had always enjoyed drawing, I absolutely loved painting. I don’t quite know what it was, in part I think it was being able to use color. Also perhaps the paint itself, I just liked playing with it. My first experience with painting in high school was with children’s tempera paint which was really difficult to work with, but I did what I would consider my first “real” painting. It was a monochromatic landscape painting of a river in France. I was really excited and proud of that painting.. . I later majored in painting at Hartford Art School, I worked with two amazing professors who have since passed on, Susan Wilmarth-Rabineau and Stephen Brown. I learned the expressive power of paint from them; that paint isn’t something that you just place on a canvas – it is a wonderful substance that you manipulate and play with. I will always be in their debt. Can you talk about some of your creative influences, where do you find inspiration? I find inspiration everywhere. Specific art influences would be 20th century modernism, in particular the Abstract Expressionists. 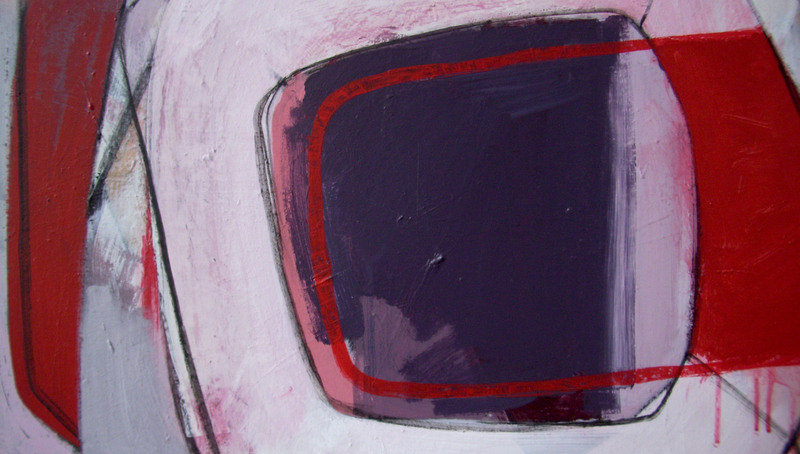 I’m constantly inspired by the works of Joan Mitchell, Willem De Kooning, Phillips Guston and Richard Diebenkorn. Cubism is always in the back of my mind. I fell in love with Cubism while in high school and I’ve never gotten it out of my system. I like how it organizes and distorts space. It is probably more of an influence on me than I realize. I am constantly inspired by my practice of yoga which has deepened and expanded my awareness of my body, both positively and negatively. Yoga requires great mental focus and physical strength to maintain the poses – if one of these elements is missing, you fall. These paintings strive to achieve this same balance. Art, like yoga, can be difficult. If something is out of balance it can ruin the piece, or make it…you never know. Yoga has taught me to be patient with my work. Twitter has been a surprising source of inspiration. Thanks to Twitter I have met exciting and interesting artists all over the world that I otherwise would never have had the chance to. It is a source of constant stimulation. I even got the titles for a number of paintings for my current show from Twitter. I explained the ideas I wanted to express and tweets came back with words describing that exhibition’s theme. Interface…perfect. How does Hartford factor in to your work? Anything that really makes this a great place to live and create work? 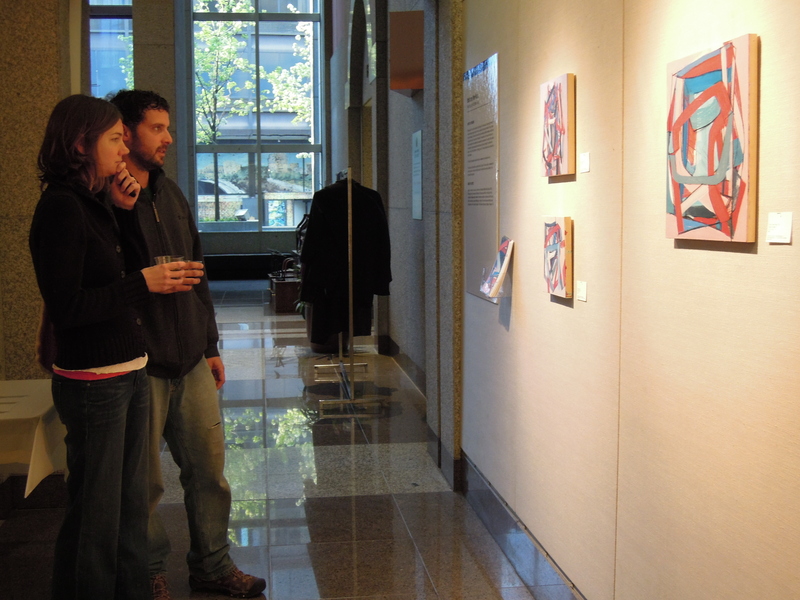 My first experiences viewing art were at the Wadsworth Atheneum in Hartford. I still vividly remember elementary school field trips to the museum and seeing the mummy and the Sunbather by Duane Hanson. In high school after I became more interested in art I used to go to the Atheneum as often as I could. It was an essential part of my education as an artist. I was exposed to so much art. I was really lucky to have the museum as a resource. Much of their collection has been a constant presence in my life, kind of like old friends. My studio is in the same building as Real Art Ways and I’m grateful to have such a great space to work. There is such diversity of people and scenery within the Hartford area, these influences are constant within my work. And with venues such as the Greater Hartford Arts Council showing and bringing in new talent its great to see the city building up its arts community. What I love about living here is that Hartford is a city, with all the character and diversity of larger cities, but without having the more negative realities and pressures of living and working in those larger cities. What are you working on now? What direction is your work taking? Since finishing my paintings for the 100 Pearl Street Gallery show, I have mostly focused on drawing. I have been working on a series of somewhat large ink on paper drawings focusing mainly on mark-making and gesture repeated over and over again. They have a sort of disorienting feeling to them, as you look at them different layers of the drawings seems to emerge. The impulse is to interpret them as writing but they are, of course, purely abstract. After working so intently on the paintings I have found them more relaxing and somewhat playful to work on. I recently took a trip to Detroit to visit friends and the graffiti combined with the decayed architecture was really exciting and interesting to me. A few sketches I have done since have reflected this but nothing concrete has come out of it yet. A rougher way to working, the application of paint is looser. Thanks to Matt for answering my questions! You can learn more about Matt by following him on Twitter (@Matthew_Best) and checking out his Tumblr pages : http://newparkave.tumblr.com/ http://matthewjbest.tumblr.com. As the newest full-time employees of the Arts Council, Evan Johnson, our Grants Administrator, and I were asked to head our internal 2012 United Arts Campaign this week. Just like other workplaces and workplace coordinators who host campaigns, we were charged with the task of planning and orchestrating interactive and fun artsy events for our coworkers to encourage them to contribute to United Arts. The Arts Council’s workplace giving campaigns have been integral to supporting our local arts community and to substantiating our United Arts campaigns throughout the years. 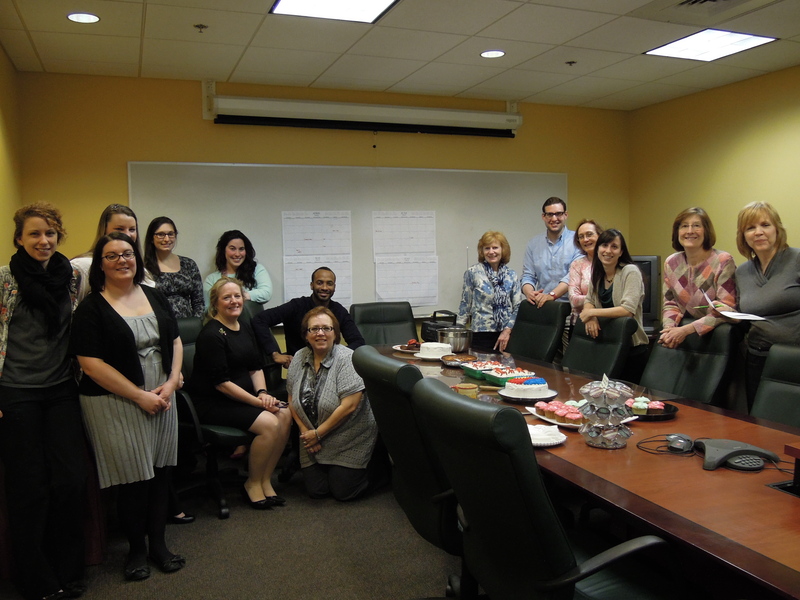 Partnering with local businesses and in-company coordinators, the Arts Council helps teach employees the importance of the arts in Greater Hartford and asks for their support in keeping the arts a strong, vibrant and vital part of our community. Fueled by our ambition to make this year’s campaign successful, unique and interactive, Evan and I began planning activities for this week about a month ago. 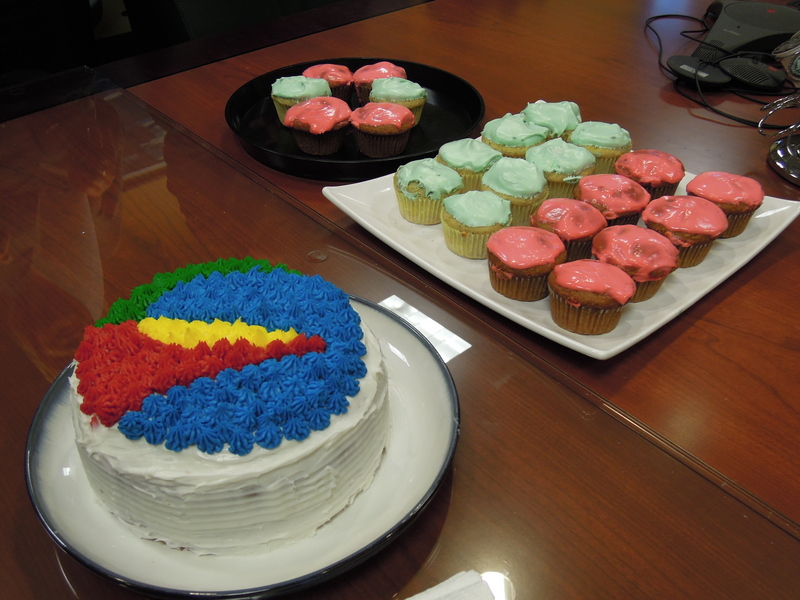 During our brainstorming sessions, Evan and I thought a creative bake-off contest would unlock our coworkers’ artsy sides in a fun, different way. We also thought that having a $25 gift card on the line for the winner would inspire some friendly competition throughout the office. Although I couldn’t enter to win the contest because I was an organizer, I still wanted to participate in the competition and prepare a dish for everyone. My intentions, despite being noble, were thwarted by my abysmal culinary abilities. I ended up deciding to craft a volcano made of chocolate lava cakes decorated to look like it was erupting with red and orange frosting (clever, right?). 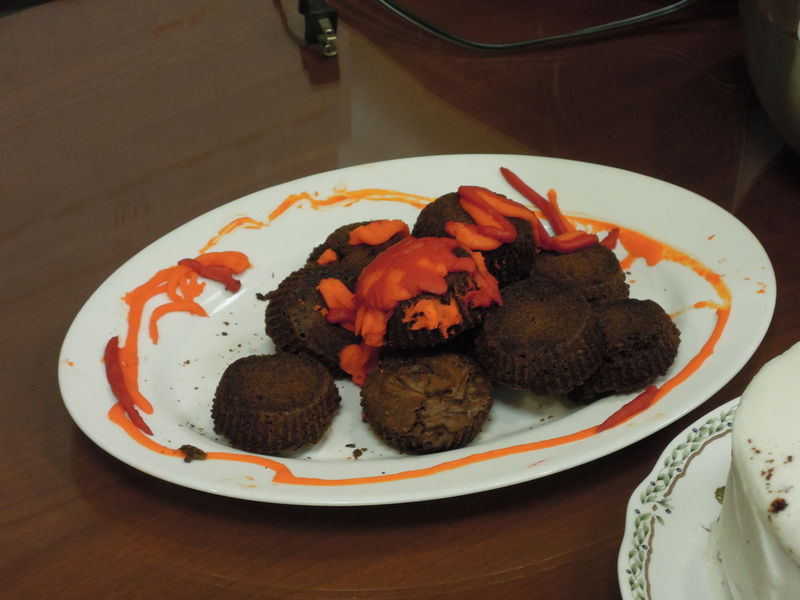 The end result was a mound of brownie-looking stacks rendered ridiculous by random streaks of red and orange. Destined for the Spirit Award, I placed my concoction on our board room table amidst some incredibly elegant baked goods. Immediately eye-seizing was a cake decorated as the Arts Council’s logo prepared by Allison Young, our Events Manager. 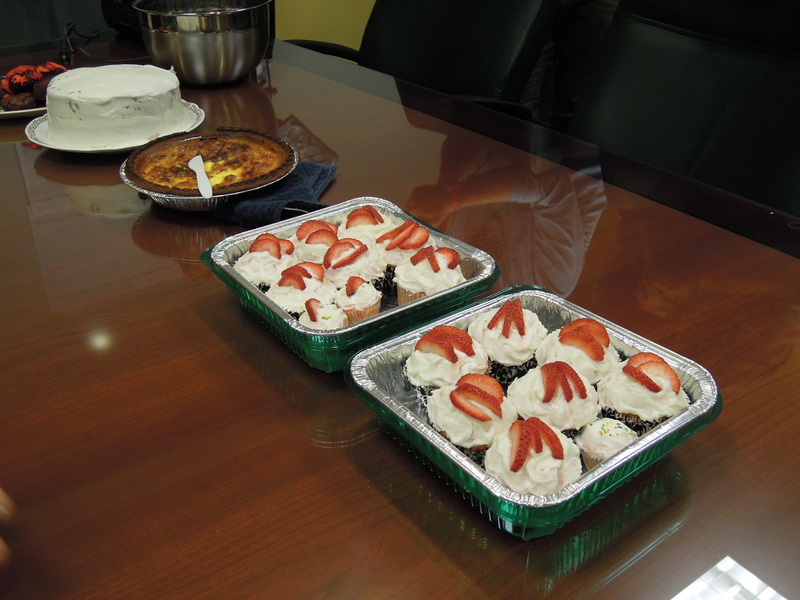 However, from strawberry lemonade cupcakes to recipes from the Depression era, the competition for the baker’s crown was fierce. Ultimately, it was up to Evan to choose a winner and, after a controversial decision, Allison’s logo cake was the overall victor for the day. Have you picked up your copy of Hartford Magazine yet? This month’s (April 2012) issue of the brand-new Hartford Magazine features photos of local arts leaders (remember this photo shoot?). Check out the player’s spread to see our CEO, Cathy Malloy, featured alongside the curators, executive directors and “movers and shakers” of the arts scene. Subverting this common visitor sentiment is one of the major challenges that cultural organizations like the Mark Twain House & Museum face everyday. Luckily, through frequent and unique programming, the Twain House expands the possibilities presented by Twain’s home and literature in exciting and engaging ways that mix entertainment and culture seamlessly. For instance, last Thursday (Mar 22), I attended the Get A Clue! Tour, where I had the opportunity to harness my inner detective in a live-action version of CLUE with Sea Tea Improv throughout the Twain House. Brushing the cobwebs off my finest pipe, I grabbed my friend Amanda (with a surprise cameo by the fiery Susan Williams, the Arts Council’s Welcome Center Coordinator) and prepared to unravel the mystery of who killed “Pap” Finn in hilarious and glorious fashion. The Twain House, like the stately home in the game CLUE, has a Conservatory, a Dining Room, a Library and even a few secret passages. The tour, however, would deviate from characters like Colonel Mustard (my favorite) and Miss Scarlet and replace them with classic Twain characters like Huck Finn and the Connecticut Yankee – all brought to life by on-the-spot comedy extraordinaires from Sea Tea Improv. As the tour began, the guide handed out sheets the resembled the standard CLUE check-off list, which included three separate categories to determine the murderer, the murder weapon and the murder room. At that point, he explained that by asking questions, each character would be able to eliminate two options from our check-off list, as well as provide a good sassing to guests. Suspicious of where his loyalties rested, I subtly etched the tour guide’s name at the top of my suspect’s list, although he assured me that wasn’t possible…exactly what the murderer would say. Horrific shrieks of betrayal and death greeted us as we entered the dark and ominous Twain House as the tour began. Our tour guide first wisped us to the kitchen, where we were heartily greeted by the drunken Muff Potter. As he stumbled his way to support himself and to our questions, it soon became clear that the audience was a vital part of the show like any improv performance. As such, Amanda and I played along by mixing snarky one liners with real questions. For instance, after a long tirade about her purity and virtue, Amanda and I accused Becky Thatcher of committing “the dirty deed (the murder, obviously!) in the bedroom.” Her sharp return suggested she wasn’t very happy with our insinuations, but I think Mark Twain would have given us at least a head nod for slightly clever wordplay.